with a little inspiration, jane can…do anything! 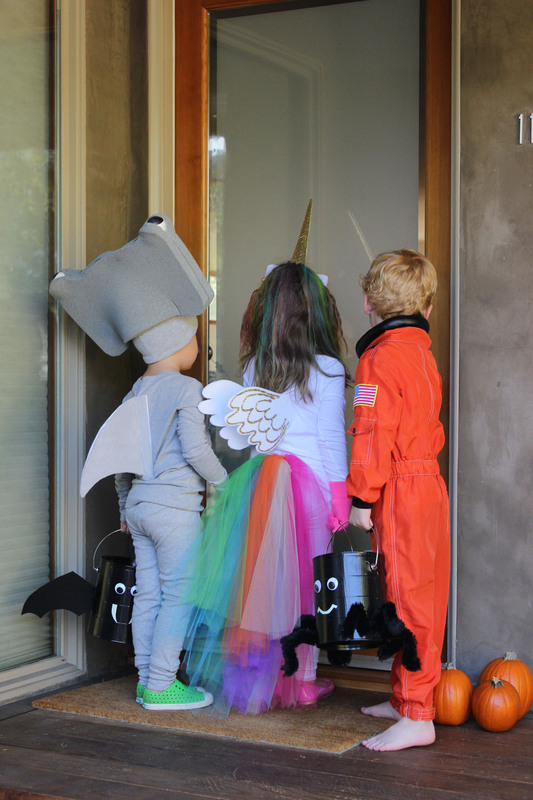 Our kids love dressing up for Halloween, so much in fact that they couldn’t wait to dress up for this article! In the past we have always bought their costumes, but this year we wanted to try to make them. As soon as the kiddos found out we were making costumes they couldn’t wait to tell us what they wanted to be. They had a ball getting involved in the process of picking out the bits and pieces that made up their outfits, and we loved how easy they were to make! A little known fact about us…we can’t sew. We can cut, we can embellish and we can glue up a storm. 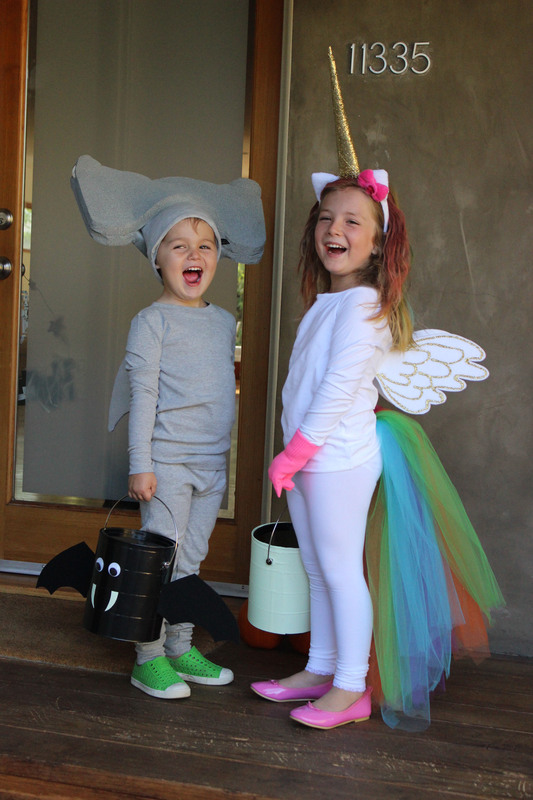 So we worked with our strengths and created these absolutely adorable costumes that required no sewing at all! The base for all our costumes were basic t-shirts and leggings. We found Mia’s at H & M, and Charlie’s at Primary. 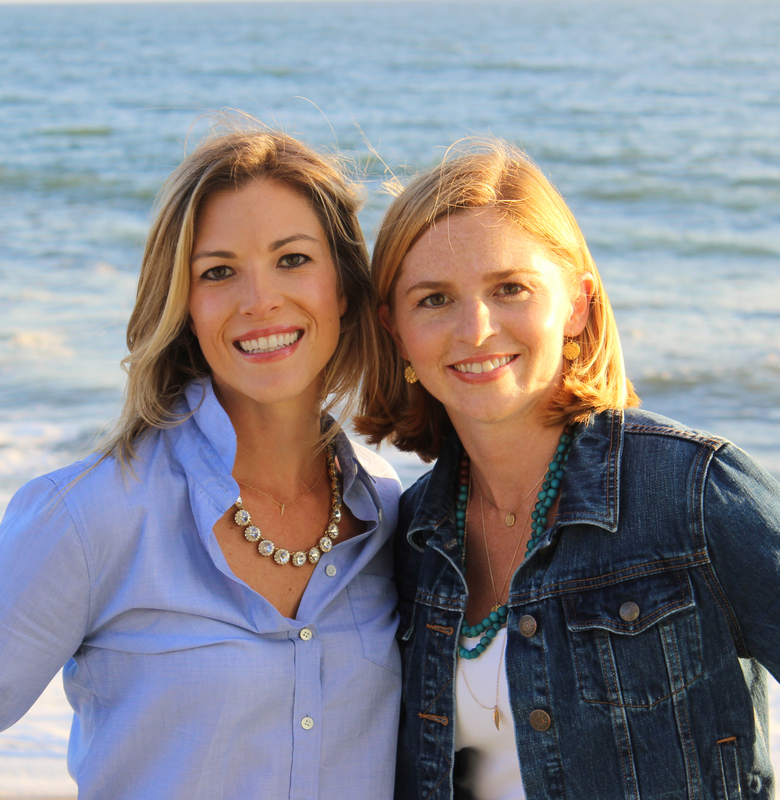 We chose these two brands because they offered a wide variety of very affordable basics so we didn’t fret about making permanent alterations to the clothes. Charlie didn’t just want to be a shark, he wanted to be a hammerhead shark! The minute we heard his request we burst our laughing at how funny it would be for Charlie to walk around with a hammerhead hat. 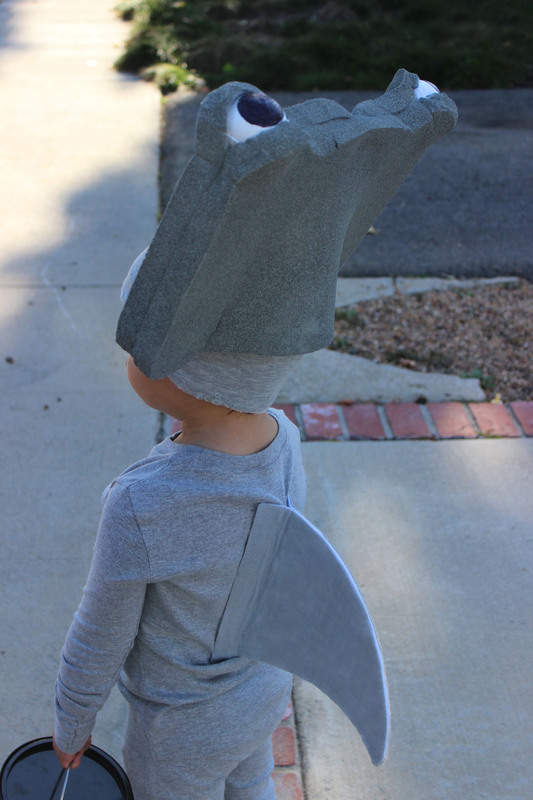 For his hammerhead shark costume we started with a grey t-shirt and pair of grey leggings from Primary. 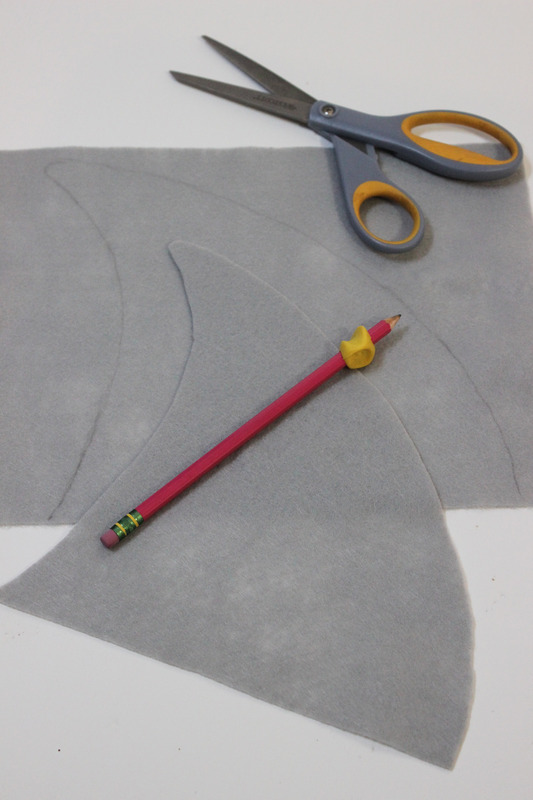 To make the fin, we cut two pieces of grey felt into a fin shape and glued them together with Felt & Foam glue, leaving he bottom 1″ of the fin unglued. Once the glue was dry we glued the fin to the t-shirt. First we placed a piece of card stock inside the shirt so that the glue wouldn’t seep through the shirt. 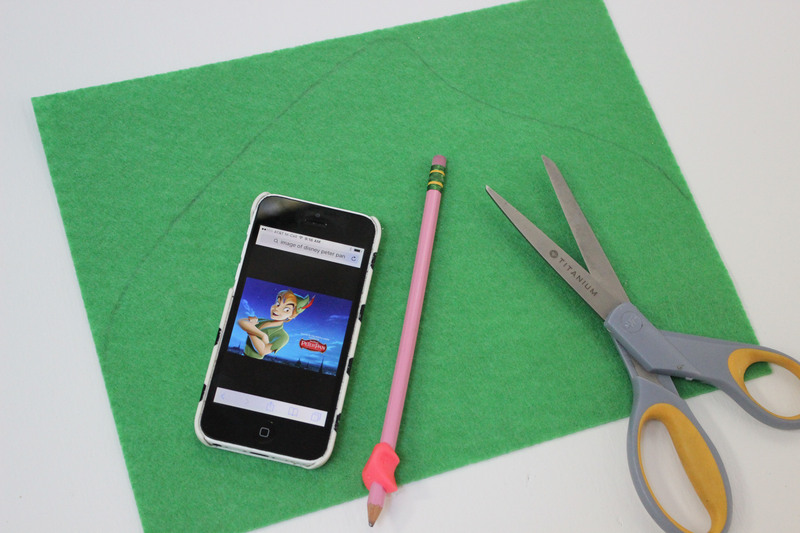 Then we placed felt glue inside on both sides of the fin, on the 1″ bottom section we that didn’t glue earlier. Then we opened the 1″ flaps and placed them onto the t-shirt. The glue needs a full 12 hours to set so we taped the fin in place on the t-shirt using painter’s tape. To make the shark’s hammerhead, we started with a grey beanie from H & M. We cut two rectangles with rounded edges out of two pieces of upholstery foam. Using the Felt & Foam glue again, we sandwiched the top 1/3 of the beanie between the two foam rectangles. Then we took two, white styrofoam balls and stuck them part way into the top corners of the foam to create the eyes. We secured the styrofoam balls in place while the glue dried using rubber bands. We placed books on top of the foam rectangles to hold them all together until they dried. Once the glue was dry on the hammerhead hat we painted it with grey craft paint and added black pupils to the eyes using a black sharpie marker. If your kid wants to be a shark and does not NEED to be a hammerhead shark specifically, there is no need to make the hammerhead hat. All you need is the grey beanie! 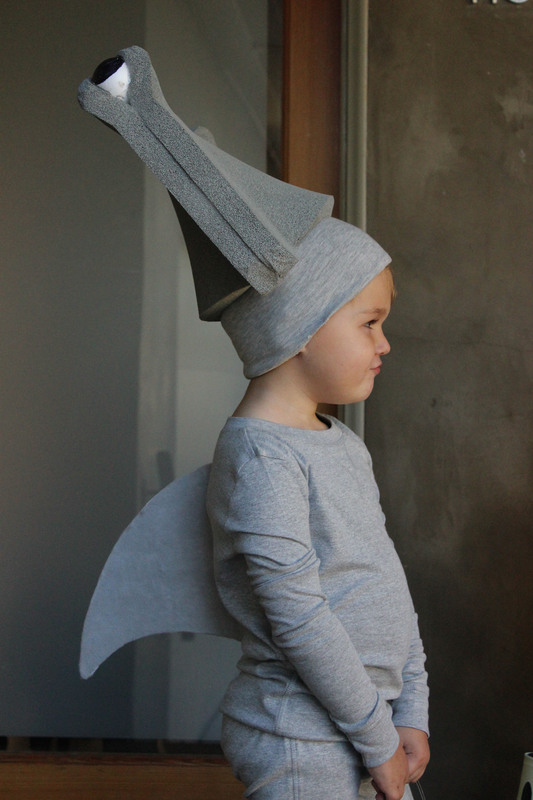 The shark costume would be great for a kid that does not want to deal with an elaborate costume. 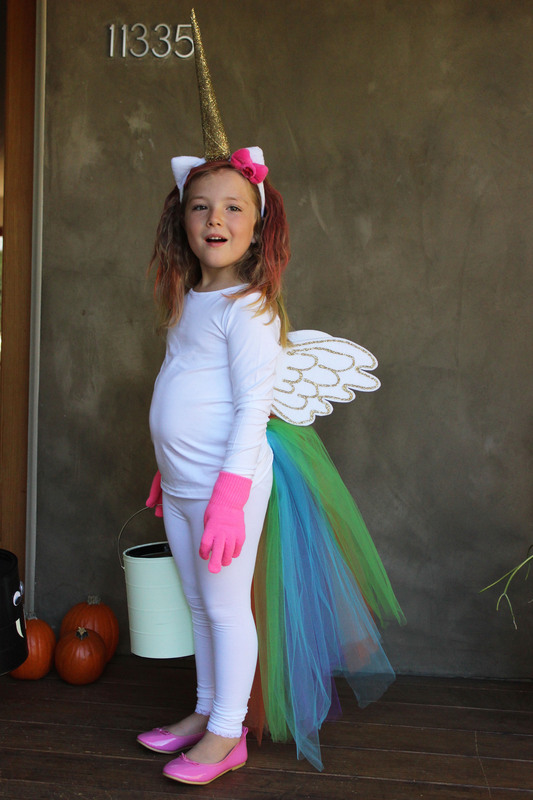 Mia was very specific about her costume…she didn’t want to be just any unicorn, she wanted to be a rainbow unicorn, with wings of course! 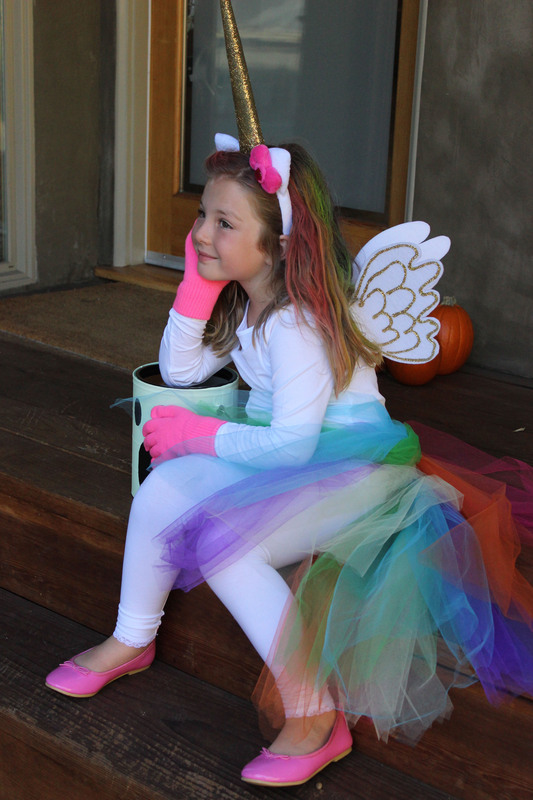 The wings are completely optional on this costume, but we loved the idea so we had to make them too. We started with a white t-shirt and white leggings from H & M. We also found the pink ballet flats and pink gloves at H & M, which were perfect for her “hooves”. 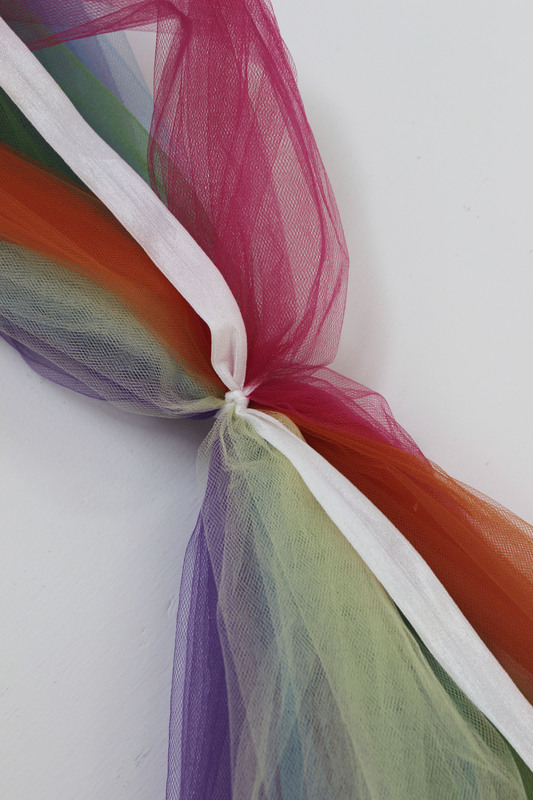 To make Mia’s rainbow tail, we purchased lengths of tulle from the fabric store in 6 colors (pink, orange, yellow, green, teal and purple), measuring 1 1/4 yards each. We gathered all the lengths of tulle together and tied a 1 1/4 yard length of white elastic around the middle of the tulle and secured it with a double knot. Once Mia was dressed in her white outfit we tied the elastic around her waist so that the tulle was in the back, creating her rainbow tail. To make her unicorn horn, we started with a white headband. We found ours at Target and it just happened to have ears and a bow, but you could easily use a plain headband. Then we made a diagonal, lengthwise cut all the way up an old paper towel roll. We twisted the paper towel roll to create a cone shape and secured it with painter’s tape. We coated the horn in glue and covered it in fine gold glitter. Once the horn was dry we secured it to the headband with clear packing tape, then covered the tape in glue and glitter to hide the tape. 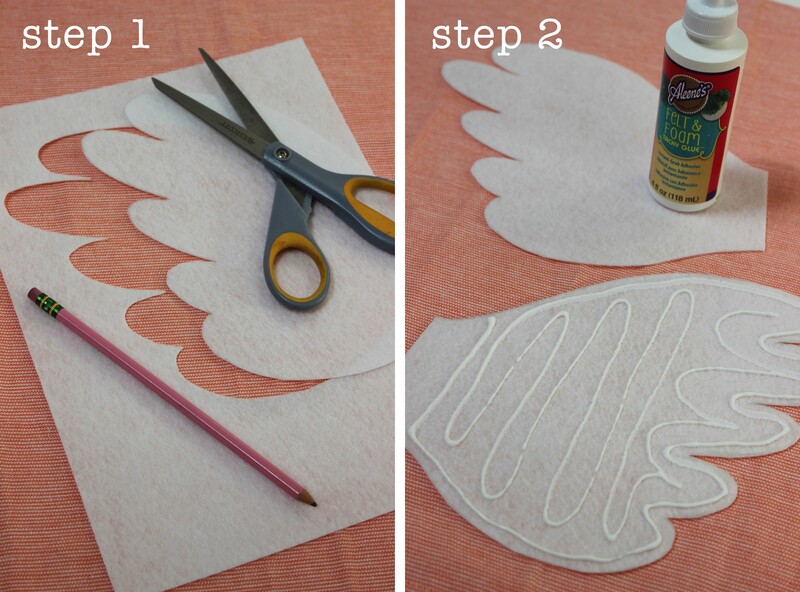 Like we mentioned earlier, the wings are completely optional, but we wanted to include the “how-to” just in case! 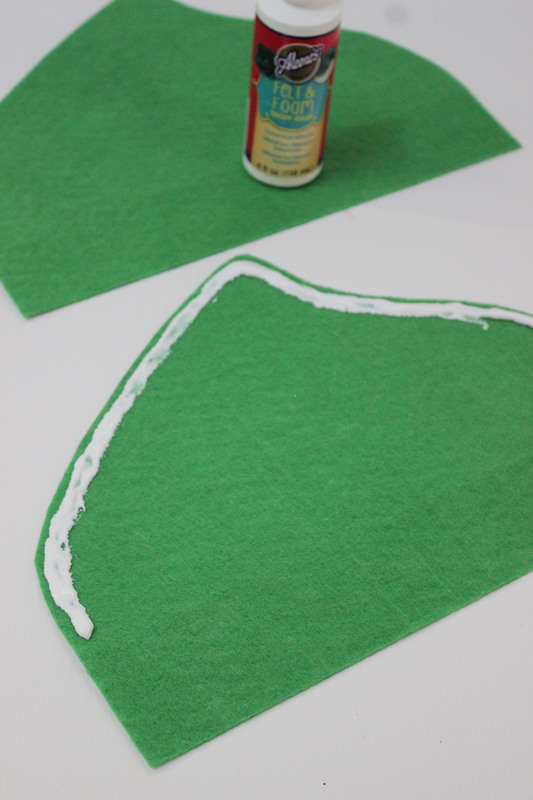 Using stiffened white felt, we cut out 4 wing shapes. Then we glued two wing shapes together, leaving a 1″ section unglued, and repeated these steps with the other set of wings. Once the glue was dry, we made designs with glue on the wings and covered them in gold glitter. As soon as the glitter was dry, we attached the wings to the back of Mia’s t-shirt using the same technique we used to attach the shark fin on Charlie’s costume. You can’t have a rainbow unicorn without a rainbow mane, so we spray painted Mia’s hair with different colored hair sprays to create her rainbow locks. If you’d rather skip the hair spray, you could use a variety of colored hair extensions to achieve a similar effect. 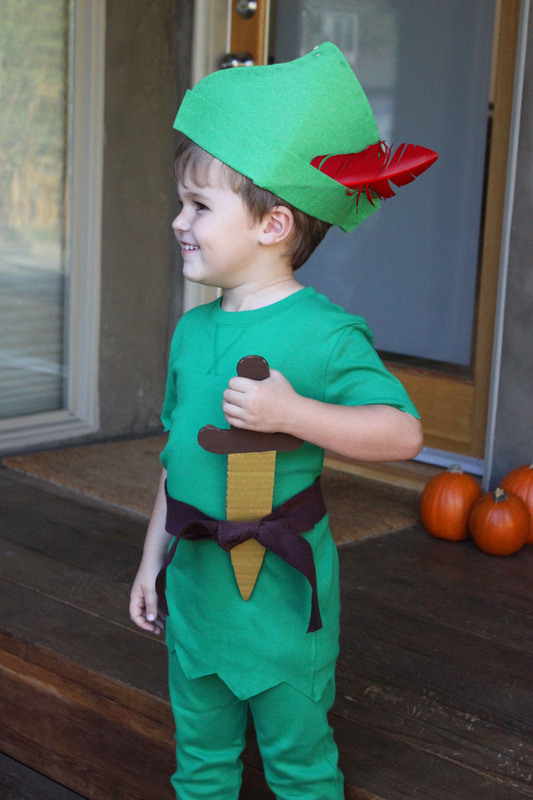 Charlie also really wanted to be Peter Pan, and who can say no to that adorable face so we just had to make him a Peter Pan costume too. Peter Pan was definitely very easy! We started with a green t-shirt and leggings from Primary. We cut a jagged edge along the end of the sleeves and the hem of the t-shirt to create Peter Pan’s shirt. Then we cut a narrow strip of brown felt and tied it around Charlie’s waist for his belt. 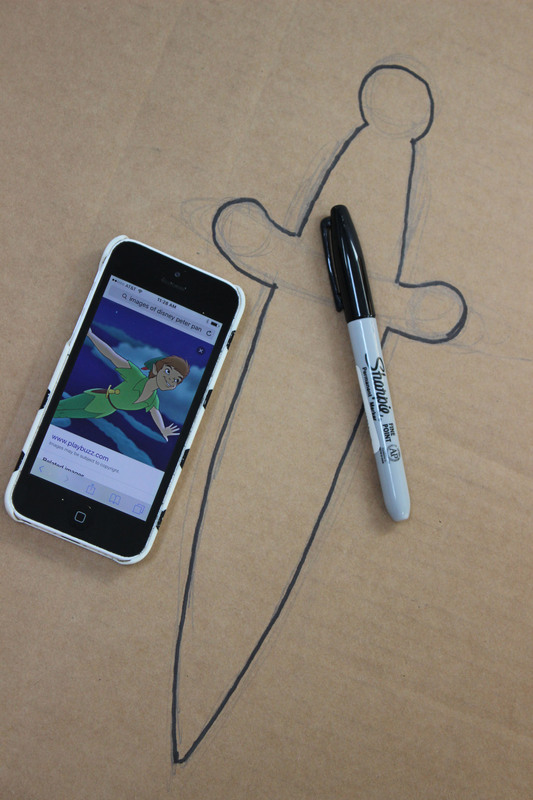 To make the dagger we referenced an image from the classic Disney movie and drew a picture onto cardboard. We cut out two dagger silhouettes, glued them together and then painted them with brown and metallic gold craft paint. To make the hat, we measured Charlie’s head and cut out two pieces of green felt in the shape we wanted (by referencing the classic Disney movie again). We glued the two pieces together with felt glue, leaving the bottom 1 1/2″ unglued. Then we folded the bottom edges up, stuck a red feather in the fold and glued the fold down. If you’d rather skip the step of making a hat, you could always use a green beanie, fold the edge up and glue a red feather into the fold. Making our costumes really was so much fun, and far less scary and challenging than we anticipated. We may try to do this every year…or at least as long as the kids will let us!